I finished my Honda CB350, well mostly finished it, couple small things to do still. 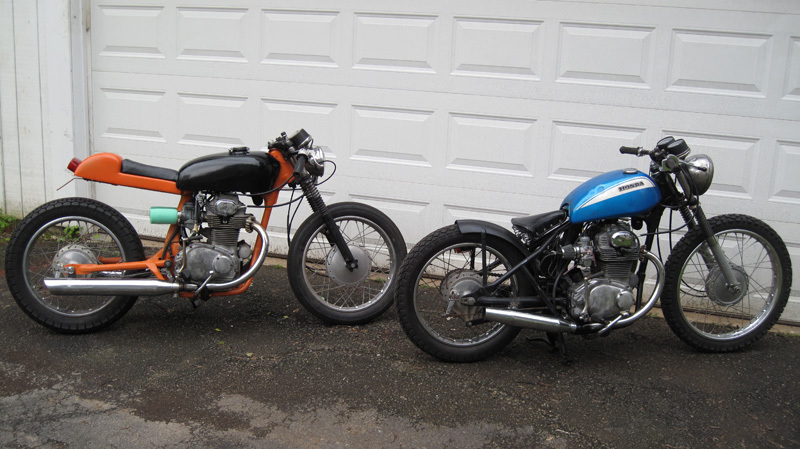 This is 1 of 2 CB350s I have, the other one is on the bike lift right now being stripped and fitted with cafe parts. I'll finish it sometime this decade. I'm not a fan of the stretched out bobbers, i think they look funny, so i kept mine stubby. This is what I started with. Stripped all the junk off I didn't plan to use and took it down to the bare frame so I could cut and weld it up. First cut made just passed the rear down tube. 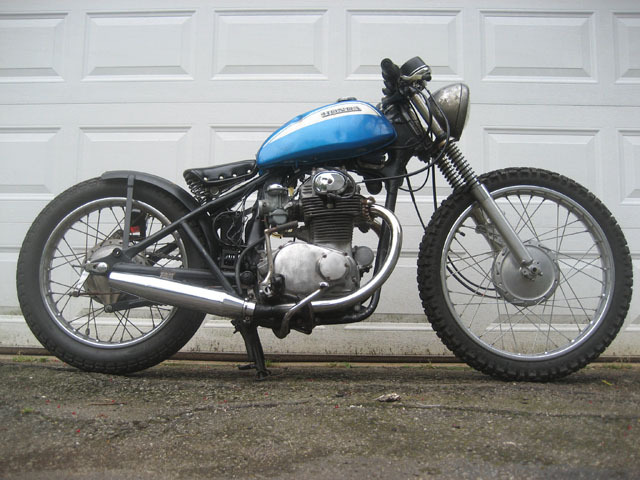 CB350s use a pressed sheet metal frame which is ok for the underpowered bikes but it looks like poo. I cut the top of the pressed frame out and welded in a single down tube. This was a lot of work to make it look somewhat stock but worth it in the end. I used drag bars that I narrowed 4 inches in the middle, they stuck out too far. The gas tank is off of a Honda SL175. The seat is a spring bicycle seat made by Schwinn. I found a 21" front rim that fit it perfectly, the rear rim is stock 18". The fender is a spare tire cover from a 1934 Ford car. I got brand new aftermarket carbs for it with new controls and all new cables from Motion Pro. The exhaust pipes are generic ones from JC Whitney. I shortened the center stand to allow the wheels to touch the ground when the stand is up. I wired the bike from scratch and only wired what was needed. It has no horn, turn signals or kill switch. The key is the only way to turn it off. I plan on making a license plate bracket and getting a new headlight, I don't like this one, it's too small. I think that's about it. Lots of work but I'm pretty pleased with it. if I can I only buy rearden steel and danconia copper. It's a Schwinn bicycle seat I got on ebay. The CB350s are too small for regular motorcycle seats. Tasty waves and a cool buzz. One question though, do you slip off that seat at all? Seems like its tilted back pretty far. Ya know, you could lop off the last of the uprights as long as your weld the swingarm at the pivot point and you wouldn't have to listen to the whining. I dig you little bike man, good call on the bicycle seat too...fits well. i like the bike also and........i also dont like stretched out bobbers.....the stubs are awesome as far as i am concerned....good work. i'm a fan of this bike i just wish it had a different seat. Updated pics with new headlight and Harley mufflers.